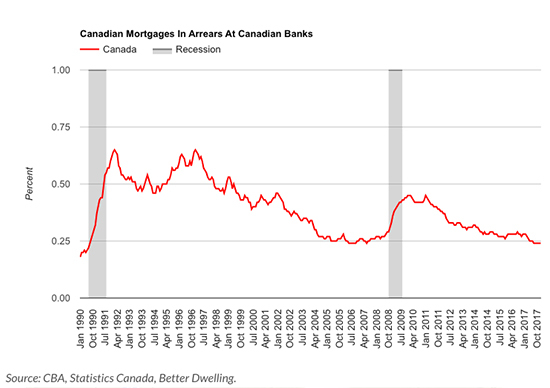 Canadian real estate borrowers are paying their mortgages at a near record pace. 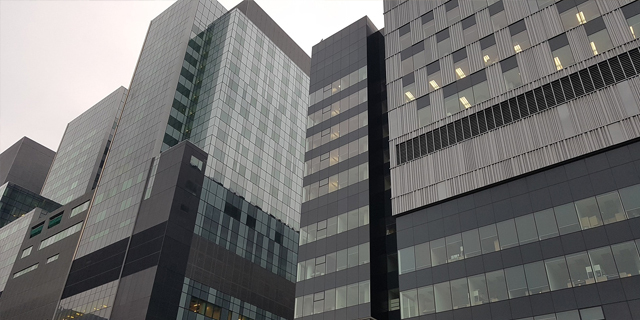 Filings with the Canadian Bankers Association (CBA) for the first quarter, show mortgages in arrears have fallen to new lows. The largest markets of Ontario and BC are just off of record lows. That sounds like great news, but more often is a sign of an overly liquid market. A mortgage in arrears is a simple concept, that’s often misunderstood – especially by the banking and real estate industry. A mortgage is classified in arrears when payments are more than three months late. Most people think this is a leading indicator of health for real estate markets. Unfortunately, it doesn’t tell people what they think it does. Mortgages in arrears are a greater indicator of market liquidity. Record low levels of arrears are often observed when markets are overheating. Some people argue low levels of arrears are a better indicator of a bubble, since it represents an overly liquid market. There’s little reason to default in these markets, since you can sell your home after you miss your payment, but before it goes into arrears. Liquidity starts to dry up after prices start to drop, and people aren’t in a rush to buy. By the time you see arrears start to climb, prices have typically already begun falling. Simply put, a rise in arrears trails price drops. Mortgages in arrears across Canada are falling, to one of the lowest levels in history. Only 11,641 mortgages fell into arrears at Canadian banks in January, representing 0.24% of all mortgages held. This is the sixth month it’s been at this level, and we’ve only ever seen it hit this level two other periods – in 2006, and 1990. 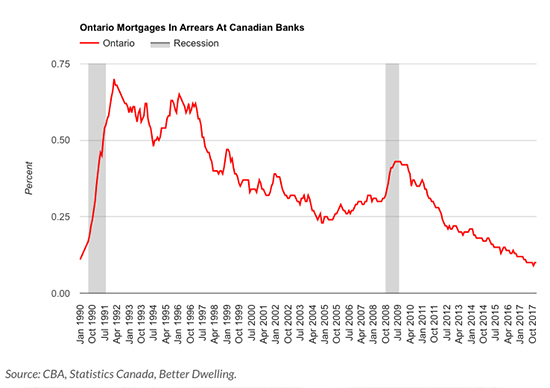 Ontario mortgages in arrears are just off the record low. Banks reported 1,987 mortgages in arrears in January, 0.10% of the total held. This is a 16% decline compared to the same month last year. A record low was hit in the past quarter, when we saw the ratio hit 0.09% in November 2017. Arrears are a little higher than the month before, but still very close to that record. 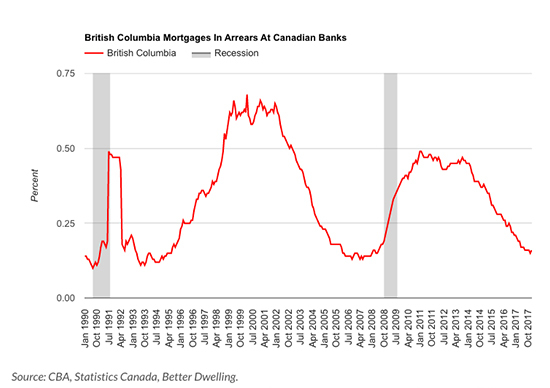 British Columbia saw mortgages in arrears rise just off of an all-time low. Banks reported 1,008 mortgages in arrears in January, representing 0.16% of the mortgage pool. This represents a 23.8% decline compared to last year, and we’re just off the all-time low hit in December 2017. 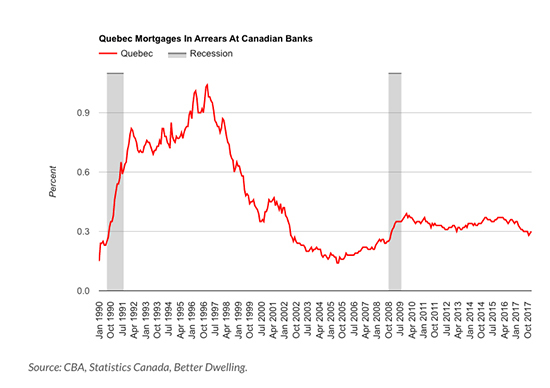 Quebec is seeing middle of the road performance in terms of mortgages in arrears. Banks reported 2,719 mortgages in arrears for January, 0.3% of mortgages in the province. This is down 14.28% compared to the same month last year, and the second month in a row we’ve seen the ratio climb. Being somewhere in the middle is actually a healthy thing. Mortgages in arrears at Canadian banks are hitting record low levels. This is great for banks, but often indicates a highly liquid market. When markets become overly liquid, they’re often referred to as exuberant. Is this too much of a good thing?